The latest in the series of cherry bouquets. This one uses Cricut Flower Shoppe, Winter Frolic, Winter Woodland, and When It’s Cold Outside cartridges. 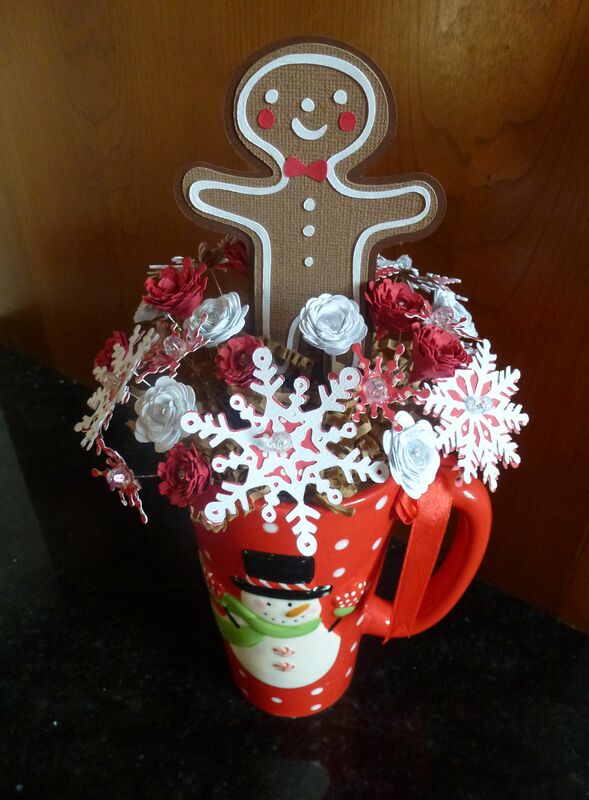 Using 3″ floral pins meant that the styrofoam needed to be near the lip of the cup. I made an impression in the styrofoam by pressing the cup into the styrofoam, marking the impression with a pen, and then trimming away the excess with scissors. The styrofoam snugged in about a quarter inch from the lip of the cup. I put a lot of glue on top of the styrofoam and mounded the kraft paper shreds with the highest point in the center of the cup. To assemble the snowflakes was super easy – stick the pin about 3/4 through the hole of the snowflake or straight through the center if there is not a hole, glue the underside of the bead, and finish inserting pin until the bead rests on top of the snowflake. Let it dry for a while. I used Aleene’s Original Tacky Glue for all of the steps of this project and it worked well. The flowers are from lightweight card stock. I have found the heavier papers are more challenging with the smaller flowers. To assist you with making the flowers, I have put together a little tutorial. If the photos are running, you can click through to the beginning. And if they aren’t running, just click on the photo below to see each of the steps. What a fabulous idea! I love that you used snowflakes in the bouquet too. I think I just found a centerpiece for Christmas Eve dinner! Lovely slideshow tutorial too!! Just perfect! I was wondering if you had returned home! Looks like you did unless you found a Cricut while traveling.